Uber Technologies Inc. on Saturday halted a pilot program for self-driving vehicles following an accident on Saturday in Arizona. 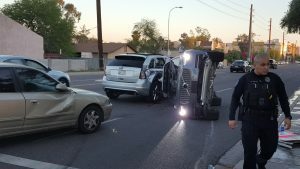 The accident took place in the city of Tempe after the driver of a second vehicle made a turn and failed to yield to a self-driving Uber, police said. Two drivers were sitting in the front seats of the Uber car when the crash took place, the company told Reuters. Tempe Police Sgt. Josie Montenegro said the Uber vehicle, a Volvo SUV, was not responsible for the accident, which caused the car to flip on its side. Nonetheless, Uber said it would suspend a self-driving car program until an investigation been conducted. The self-driving pilot program began in Pittsburgh in 2016 before branching out to Arizona. The program was briefly installed in San Francisco in December, before the California Department of Motor Vehicles stopped self-driving cars from being tested there. Uber said when the program rolled out that the self-driving vehicles would need humans at the wheel in many cases, such as in bad weather. A report released in March indicated that while Uber’s self-driving vehicles are increasing the number of miles driven autonomously, they are falling below the company’s expectations. Recode reported this month that in January the self-driving cars being tested accumulated 5,000 miles on the road without the assistance of a human driver, and by February that number rose to 18,000 miles per week. But the report said the cars needed a human driver to take over about once per mile.